One of Sigma Kappa's major philanthropic efforts supports the Alzheimer's Foundation, so the tree and plant selection highlight species associated with memory, as well as to reflect Sigma Kappa's colors. Their organization flower, a violet, also represents memory and is planted throughout the courtyard. Three central raised planters have small ginkgo trees, and the center planter also features a plaque with Sigma Kappa's Coat of Arms. In that same area, special brick pavers are installed, and can be replaced with engraved pavers as part of a fundraising campaign. Wood benches provide fixed seating around the perimeter, and movable tables and chairs in the center allow for flexibility during events. At grade planting beds and raised planters help define space and highlight an existing very old laceleaf japanese maple in the courtyard. 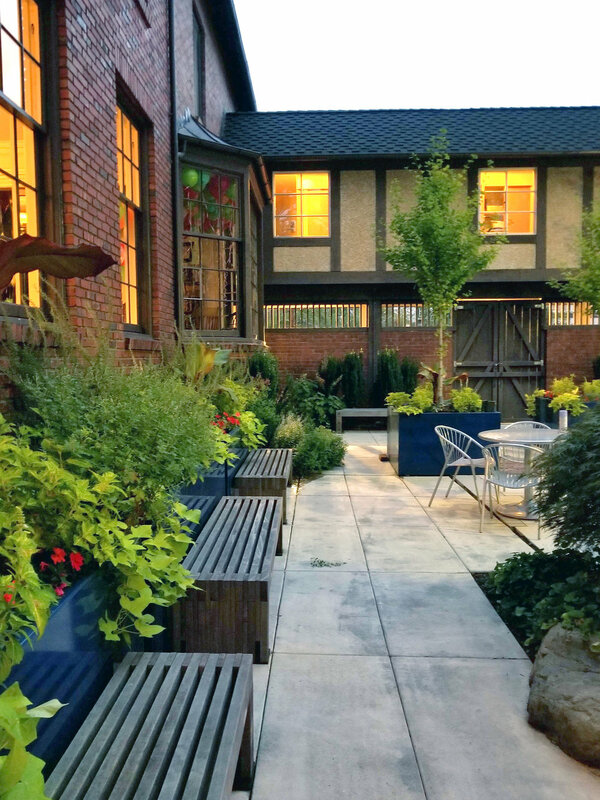 The goals for the courtyard were to create a daily usable space for the chapter members living in the house and also accommodate special events and visitors, as well as to solve drainage issues, open up the space visually, and let light in.